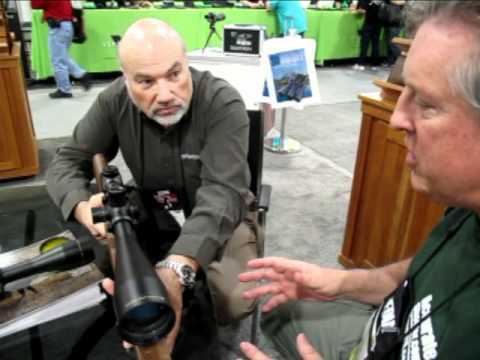 Alan Orr of Sightron unveiled some impressive products at the 2011 SHOT Show. The first is a fully upgraded Sightron SIII 10-50X60mm LR scope. When first introduced in 2010, Sightron’s 10-50X scope became an immediate “hit” with AccurateShooter.com readers. The 10-50X offered seriously powerful magnification with reasonable weight — all in an affordable package. With “street price” under $1000.00, the Sightron 10-50X was much less expensive than rival “big-name” scopes with comparable magnification. As first released, Sightron’s 10-50X scope was a smart choice for F-Classers and long-range benchresters. For 2011, the 10-50X scope has been made even better, yet the price has stayed pretty much the same. That’s the kind of progress we like. As upgraded, Sightron’s 10-50x60mm scope has new target turrets, a new reticle option (hash marks with center dot-in-circle), and dual-color, selectable illumination. At around $995.00, this scope is in a class by itself. Looking at the offerings of other scope-makers, you’d have to pay hundreds more to get a comparable 50-power riflescope with reliable tracking and good glass. 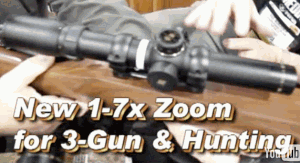 Yes the Schmidt & Bender 12-50X scope is better, but the S&B costs three times as much as the Sightron. The Sightron 10-50X’s price to performance ratio makes it a very attractive choice for F-Class and long-range Benchrest. After showing us the updated 10-50X scope, Sightron’s Alan Orr gave us an exclusive look at Sightron’s prototype 1-7X Tactical/hunting scope. This all-new scope offers wide field of view, selectable illumination and choice of 1/3 MOA or Centimeter clicks. This versatile, illuminated riflescope can be used for everything from tactical matches to big-game safaris. We definitely expect to see this compact 1-7X illuminated optic on many multi-gun rigs in the months ahead. The “street price” for the new 1-7X is expected to be right around $950.00. Expect the first units to ship in 120 to 150 days (i.e. at the start of summer). Share the post "SHOT Show Report: Sightron’s Upgraded 10-50X and NEW 1-7X"
Hope you are feeling better, I here you caught the Japenese Flue while at the Shot Show. Great looking line up of scopes. Think you guys have hit a home run with the 10 X 50 X 60. I love mine. I also love my 8 x 32.